Klear Screen- Complete Kit for Dell Screens. 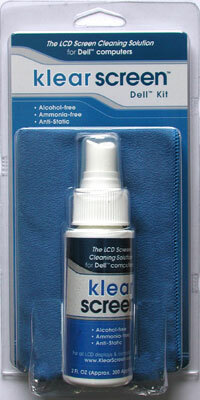 Klear Screen solution with the Optical grade Microfibre Polishing Cloths used on the Go or in the office. The bottle will provide approximately 300 applications. The wet singles with the travel size mini microfibre chamois cloth in this kit are an ideal combination when you travel. Dell and all Dell brand products are registered trademarks of Dell Inc.